1. Dissolve the yeast, sugar in half cup lukewarm water and let it sit for 3 minutes. 2. When you see air bubble in this mixture, add the flour, gram flour, saffron imitation and oil together. You need to add bit more than half cup water to make the batter right consistency. The batter will be thick. 3. Mix it properly and make it smooth. Let it set in a warm place for at least half hour. 4. Heat the sauce pan with water and sugar. Let the sugar melt and syrup is ready turn off the heat. 5. The syrup needs to be little bit cool down. 6. Heat the frying pan on medium high and pour the oil the pan. You can check the oil to drop little bit of batter in the oil, it should come up right away. 7. Fill the batter in the empty ketchup bottle and Squeeze it out in the hot oil. Its shape will be about 2 ‘’ of 2 and ½ circles (first 1 big on then inside the big one another one and connect them with straight line middle). 8. Fry them until golden- brown on both sides. 9. Take out from oil and now deep into the syrup. Let them soak in the syrup 2-3 minutes and take it out. 10. Jilapi is ready to serve. Thanks for your offer. I am really honoured. I feel embarrassed to say that I never write in Bengali before, i mean recipe writing and I don’t have software for that.But I will try. If I succeed , I let know. in number 2 when you said ‘babble’ above-you should have said: bubble. babble means to talk without making sense, like a baby will babble. But bubble is little pockets of air rising in the hot oil or water. Also, in Number 6 when you said “it should sizzle and come right away” You should have said come UP or rise to the surface right away. I hope this helps, English is probably not your first language, but you are doing quite well anyway. I just thought I would help you, since a lot of people who read your website may not understand English well and they might not figure out what you meant, so it needs to be made very easy for them. Sometimes older people too have a hard time figuring out how things should have been said. I hope this helps you out. Sorry for late reply. I am very happy to find a reader like you. It is true that English is not my 1st language and this recipe was the 1st post ever I wrote: What you or even I can feel to read this post. I appreciates your Effort. Thanks. Do you use dry yeast . Thanks. Yes I used dry yeast there. Nice to hear that you want to try this recipe. Gram flour is yellow pea flour. gram flour is available in Indian grocery . Thanks. I am waiting for the response of my request that I have made to you regarding preparation of Chum Chum in the way that the seet makers of Dist. Rajbari, Bangladesh are making which very very fimilar. Out side looks very dry with full coatings of mawa while inside the chum chum when we breake it finds full of syrup and spaces inside too. Apu, thanks for your recipe. I have 2 questions. 1. Why jilapi gets soft after sometimes. If I make it today and surve next day then it is not that crispy/fresh on the next day. Pls explain why is it so and suggest what to do. 2. I made ‘khurma’ exactly as you described in recipe. Taste is fine but not that hard as it is in Bangladesh. Pls let me know how to make it hard as desh’s one. For jilapi, Syrup is very important. syrup needs to be one thread consistency and lukewarm and fry jilapi on medium heat. jilapi will come like professional but if you serve one day after. then put in Refrigerator. khurma needs to fry medium heat, it will be hard. When khurma becomes in roomtemperature then put in syrup. hope next time you will get everything perfect. Thanks. Apa, jilapi was terribly sweet with 2 cups sugar. how to reduce sweetness? if I reduce sugar syrup will be watery. Please suggest. Your jilapi recipe is one of the best on Internet. Really appreciating your hard work to let us learn from your site. 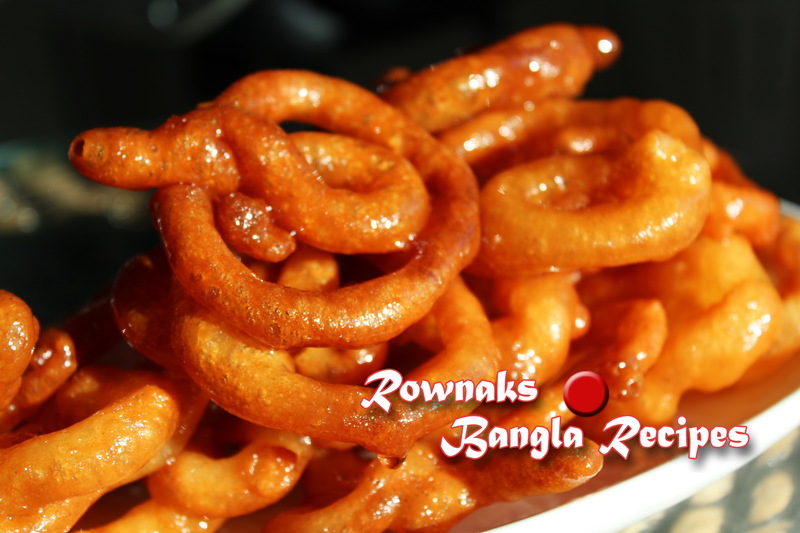 Thanks ..
খুব সহজেই করতে পারবো চেষ্টা করি ..
Love thos recipe….thanks apu…doi ta mishti hole hobe? most welcome. ei recipe-te kono doi -r use nai api.